The Arctic delivers some amazing wildlife sightings from the iconic polar bear to walrus, whales to millions of seabirds, There is something truly special about encountering animals in their natural environment and a single wildlife encounter can be the absolute stand out moment of any holiday especially when exploring the untouched environments of the high Arctic. 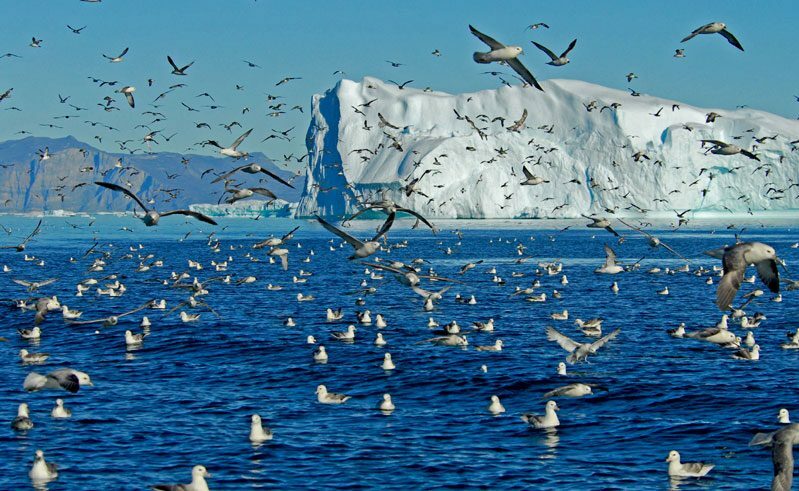 Here you can expect some amazing wildlife sightings – a polar bear prowling the pack ice, a quivering horde of walrus hauled out on a remote beach or a pod of beluga or narwhal coursing through the frigid seas. The Arctic food chain is sustained by the spring melting of pack ice. This leaves behind a nutrient-rich layer of fresh water on the sea’s surface, which triggers a bloom of phytoplankton with the lengthening days of sunlight. This rich marine environment provides sustenance for bearded, ringed and harp seals. 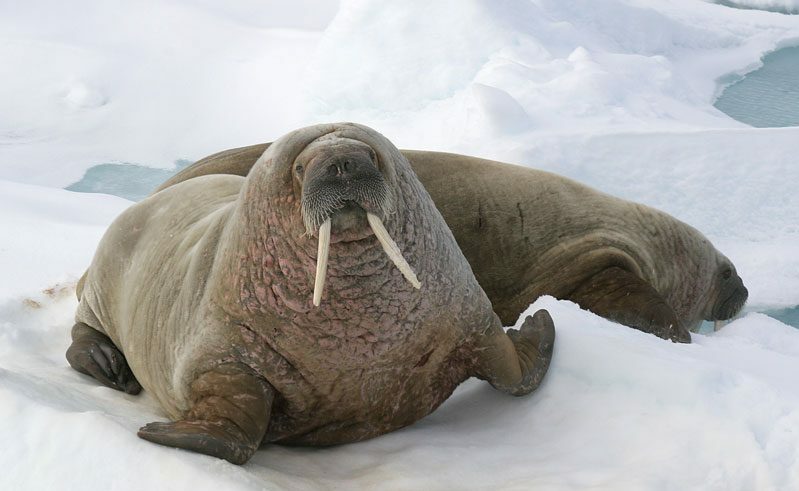 Walrus are often spotted resting on ice floes or offshore islands, and in the northern oceans, beluga, narwhal and the rare Greenland whale can be observed. On land, partial thawing of the permafrost creates pools in which mosquitoes can breed, providing a valuable source of food for migratory birds like buntings, larks, pharalopes and plovers. The tundra unleashes a flush of plant growth, grazed by millions of geese, Arctic hares and lemmings along with musk oxen and reindeer. The Arctic fox can often be seen patrolling the base of bird cliffs, awaiting a free meal as it feasts on chicks and eggs. Most visitors will hope to see the iconic polar bear, which can be seen in northern Canada, Greenland and many parts of Spitsbergen. Here, the peak time for polar bear watching is late July to early August when pack ice has retreated enough to allow ships to access prime bear habitat along the northern and eastern coasts. Most visitors to the region will hope to see the very symbol of the Arctic, the polar bear, which is as at home in the sea as on land, preying on a variety of sea mammals and scavenging on whatever else is available. Now protected throughout much of their range, these majestic predators and their cubs are readily seen in many parts of around Spitsbergen as well as northern Canada, notably Churchill, and Greenland. Another opportunist equally at home here is the Arctic fox, which feasts on eggs and chicks, often patrolling the base of the bird cliffs, awaiting a free meal. Arctic hares and lemmings graze the fragile tundra along with musk oxen and reindeer. A small population of wolves inhabits northeast Greenland but it is in Arctic Canada that they are in their element. Elusive and very shy, they are one of the more difficult mammals to observe in the wild. Polar bear fur is actually colourless. Each hair is actually a hollow translucent tube, which reflects the light, thus giving the yellowish white appearance. Their skin is black. The marine environment provides the most abundant source of life in the region with seas teeming in plankton and fish that are a bountiful larder for bearded, ringed and harp seals as well as walrus. The latter are often spotted resting on ice floes or offshore islands particularly Moffen Island north of Spitsbergen and make ideal photographic subjects. The northern oceans are particularly rich in cetaceans, and it is here that beluga, narwhal and the rare Greenland whale can be observed. Other species, such as orca, grey, minke, blue and humpback can also be seen in different parts of the Arctic, concentrating their summer feeding in high latitudes. Huge numbers of wildfowl and waders visit the region each summer, nesting in the tundra. Spectacular sea cliffs are the breeding ground for millions of pairs of guillemots, puffins, kittiwakes and fulmars, while little auks, ivory gulls and skuas each have their own preferred nesting sites.